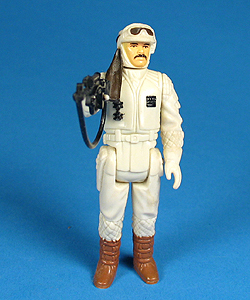 This figure first appeared on The Empire Strikes Back 41 back card. The image on The Empire Strikes Back and Return Of The Jedi cards was cropped, hiding the character that the figure was based on. The Tri-Logo card image is not cropped and the proper character can be seen to the right. Comments: The moustached man pictured above is known by the Star Wars collecting community simply as the Rebel Commander , but what do we really know about this mystery man? What?s his motivation? Where does he spend his nights? Is it a place where everyone knows his name? You?ll have to check out the text below to find out his deep dark sense-shattering secret! Major Variations: Though all vintage figures have minor variations, The Rebel Commander does have one fairly interesting variation. The figure was molded with two slightly different torsos. The easiest way to spot the variations is to look closely at the portion of the figure?s coat that is below the belt. 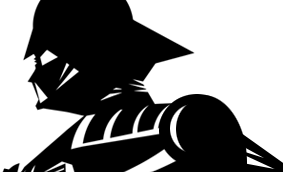 The first version only has one distinctive vertical line going straight down the center, while the second version has three vertical lines. There is no indication as to which of the two, if either, is scarcer. Interesting Side Note: The character the Rebel Commander is based on is Major Derlin, played by the then 32 year old actor John Ratzenberger, who later found fame as Cliff Clavin on the popular sit com ?Cheers?.